If you’re looking for a quick, healthy, yet easy salad to make, then I have the recipe for you! 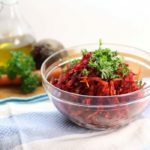 This shredded beet, carrot, and apple salad is super simple with only a handful of ingredients and limited prep. The best part about all of this is that this salad can be made ahead and kept in the fridge for up to 4 days! 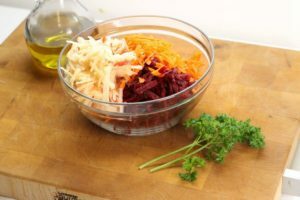 That’s almost a weeks worth of salad, in fact, you will find that the flavour only gets better as this shredded beet salad sits and marinates in it’s own juices! 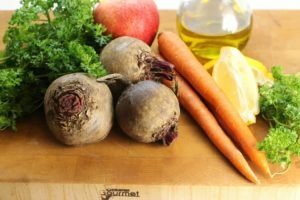 If you’re into eating seasonally, this root vegetable salad is perfect for using up the last of your stored winter beets and carrots, before you start enjoying freshly grown leaf lettuces and more tender vegetables like cucumbers and tomatoes. The apples are easily omitted and the parsley which is used as a garnish can be grown in an indoor herb garden. The first time I had this beet salad was at my parents’ house while visiting with my family. My parents love to cook and I enjoy learning and incorporating their knowledge of German food with my French taught culinary background. Root vegetables are very commonly used and available throughout North Germany where the climate can be rather cold and rainy, and provide a great supply of staple vegetables. Many root vegetables such as beets, carrots, turnips, and potatoes actually tend to release natural sugars in cooler weather and become sweeter and more flavourful when stored in the cold. Even some green vegetables such as broccoli and kale do this. When grown in warm temperatures they tend to be woody, and lack flavour. As the plant naturally converts its starch to sugar to help protect itself against freezing temperatures, the natural sugar content provides a delicious boost of natural flavours which is the secret to this flavorful salad. So be sure to use in season, winter-grown vegetables for the sweetest and tastiest results! 1tbsp brown sugar or honey, even maple syrup can be used. 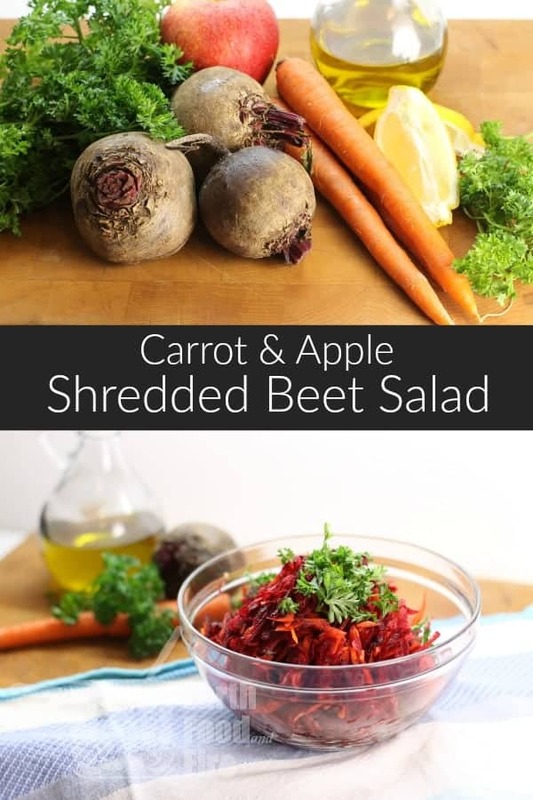 Start by shredding all your beets, carrots, and apples. I would personally peel the beets and carrots with a vegetable peeler, but I wouldn’t bother with the apple. There’s nothing wrong with using something as simple as a box grater (affiliate link) to shred the vegetables, but if you can get your hands on a food processor with a grating attachment this recipe can be made in half the time. Mix the shredded vegetables in a bowl with a pinch if sea salt. The salt helps draw out some of the juices in the vegetables helping marinade the flavours. In a separate bowl, mix together the oil, vinegar, lemon juice, sugar and whisk vigorously. Season this simple dressing with salt and pepper. Pour the dressing over the shredded beets, carrots, and apple. Mix well with a spoon or simply use your hands. Put the salad in the fridge and let it marinate for at least an hour. Once you are ready to serve or eat some of the salad, take it out of the fridge and mix in the parsley and chopped walnuts. 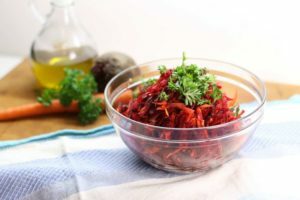 Sprinkle with a bit of lemon zest, fresh chopped chive, and sit back and enjoy a bowl of this super healthy, crisp shredded beet salad! Want more delicious recipes? Make sure you’re following me on Facebook, Twitter, Instagram, and Pinterest for weekly cooking tips, tricks, new recipes and to stay up to date with everything going on here at Earth, Food, and Fire! 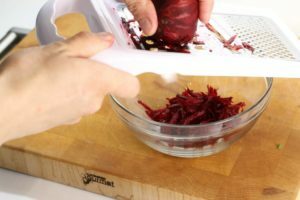 Using just a simple box grater, this healthy shredded beet salad with, carrots, apples, and walnuts is a great side to any meal. 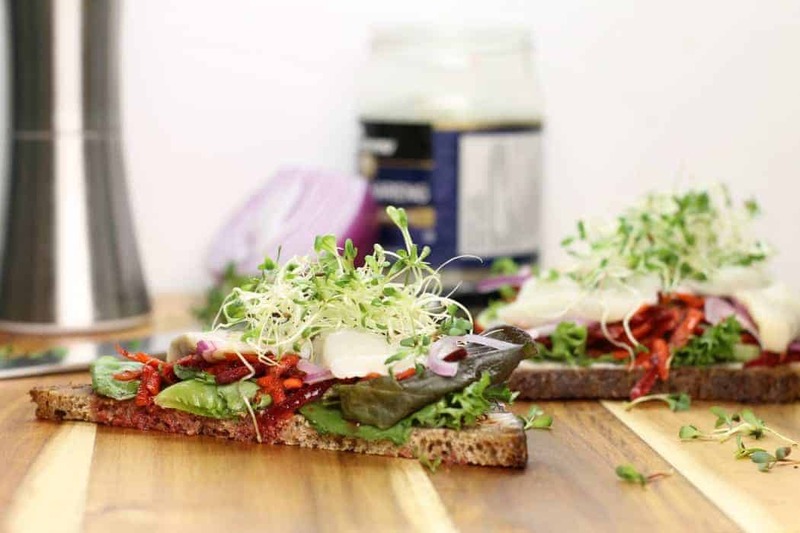 Perfect for anyone trying to eat clean! Keyword can you eat raw shredded beets?, how do you make red beet salad? 1 tbsp brown sugar or honey even maple syrup can be used. Wash and peel the beets and carrots, then core the apple. Using a box grater, shred the beets, apple, and carrots into a bowl. Mix together with a pinch of salt. Prepare the dressing by whisking together the oil, lemon juice, vinegar, and sugar.Season to taste with salt and pepper. Pour the dressing over the shredded vegetables and mix together, refrigerate for 1 hour. When ready to serve mix in chopped nuts, parsley, and lemon zest. Chopped chives are optional, but add a great fresh flavor to this crisp salad! Note that this salad gets better if it sits over night in the fridge and has a chance to "marinate". This is a recipe I have got to make for my beets-loving fiance! 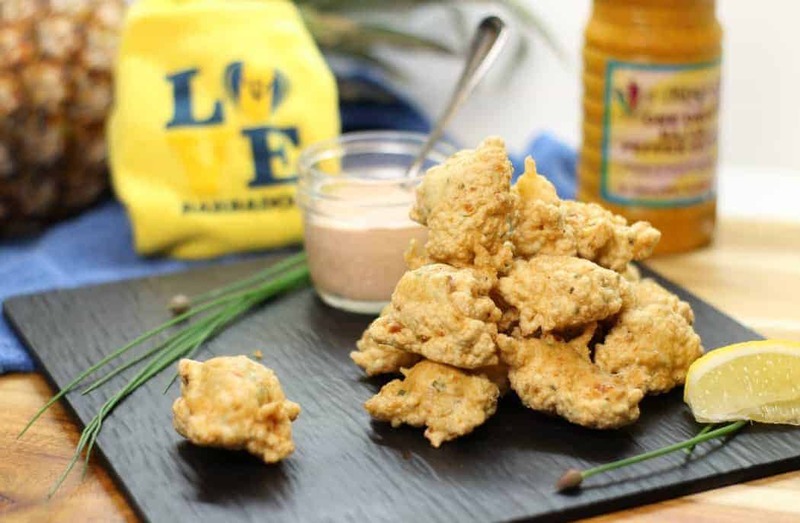 He will love it and I love how easy it is to make anytime! I’m sure he’ll love it! It keeps very well in the fridge as well! OO That would be good! Cauliflower is so under rated! 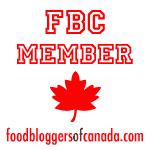 I love it raw tossed into salads, it adds a great little crunch! I’m in love with shredded raw beets so this recipe is a winner for me! And I’m always up for an apple cider vinaigrette. Great recipe! I love the apples and walnuts in this root salad — adding even more flavor and crunch. Great colors too! They make a great combo, a little sweetness, the crunch, and the earthy beet, all work very well together! I love healthy recipes like this one. I really love beets they are a favorite of mine I eat them everyday this is right up my alley! I love the idea of making a salad that will last a few days, and certainly plan to try this one! We still have beets keeping nicely in sand our cold cellar. I can’t believe I’ve never had a shredded beet salad before, I love beets so much! I will definitely be trying this soon, such a great combination of flavours. Such a colourful salad! Love the addition of walnuts in there for texture! Perfect for summer bbqs! That’s too funny, because with a French mom and a German father, I’ve eaten many salads exactly like this while growing up! It’s a great combination, very refreshing without using lettuce, and the lemon juice to me is the big star as it really enhances all the flavours. I should make this again! So good! Perfect combination and I love the inclusion of nuts for an added crunch!